Santoemma Grace Silent is a professional carpet extractor with 2 vacuum motors for rapid cleaning of large areas of carpet. New improved design September 2015. The new Grace Silent model features quieter operation with better air flow. Make less noise but get dryer carpets faster. The twin 70 litre tanks enable a long periods of operation. A professional machine, with high-waterlift vacuum system, for cleaning medium areas of carpet. The new twin high-water lift vacuum system allows recovery of the maximum quantity of dirt from the carpet and enables the shortest drying time. 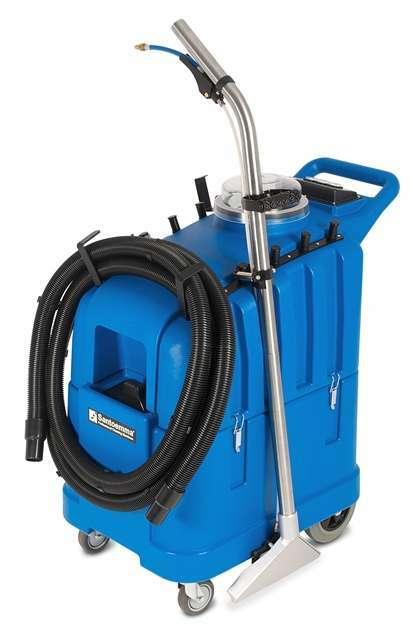 Strong, compact and easy to transport, this machine is ideal for cleaning companies. Its small width makes it particularly suitable also for cleaning in trains, busses, cinemas and planes. Optional hand-tools are available, in plastic or in aluminium. Main application fields: cleaning companies, hotels, restaurants, clubs, pubs, offices, banks, shops, rental companies, trains, buses, planes, cinemas, theaters, ferry boats, ships, schools, universities.